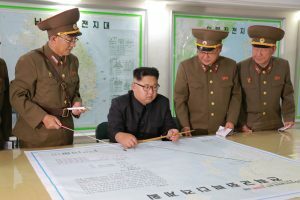 The North Korean report that Kim Jong Un has said he will wait and see what the United States does before deciding whether or not to order execution of a plan to envelope Guam with four Hwasong-12 missiles signals a decisive break in the action. This is no mixed message. It is exactly how the North moves back from the edge of the cliff. It’s classic, and anyone paying attention could have seen it coming. This is not a question of parsing the precise language Kim used. It’s the act itself that speaks volumes. Put that together with the fact that the regime hadn’t been mobilizing the population for imminent crisis over the preceding four or five days, and you get a familiar North Korean dance move. Didn’t Kim say he was just giving the Americans a little more time? Of course! He’s not going to say “I surrender” or “I’ve decided that launching missiles would be a bad idea.” This way he can project the aura of the one still in control of the situation, of the one who scored the victory, of the one who kept the region from descending into war. He can be seen as the one who has the whip hand. Who is Kim Jong Un? That seemed to be the core question asked many times this past week. But it was the wrong question. There was no way to answer something like that. The real question, the important question, the one that could be answered was: what were the North Koreans doing from August 9-14 while the US was huffing and puffing over Pyongyang’s threat about Guam? The answer, it turns out, was easy: almost nothing. There were rallies in Pyongyang and the provinces. (The two laggards held their rallies yesterday.) There were reports of youths and students rushing to declare their willingness to enlist in the army. But for the rest of the country, the message was that the way to defeat the Americans was: Stay at work! Produce more! In other words, there was no mobilization of the population in preparation for a military confrontation. Even more telling, although Western media were fixated on Guam during this period, North Korean media barely mentioned it after the initial statements appeared announcing the planning. None of the reports on the rallies mentioned Guam. The focus, instead, was on the August 7 DPRK Government statement issued in response to the new UN Security Council sanctions resolution passed just a few days before. What’s next? At this point, having broken the tension, it would not be unusual for Pyongyang to pivot to diplomacy. Kim had already signaled in early July that the North was open to putting the topics that interested the US—the DPRK nuclear and missile programs—“on the table.” In their Wall Street Journal op-ed, Secretaries Tillerson and Mattis underlined Washington’s interest in negotiations. There are still hurdles to jump over and potholes to avoid, but both sides may now be in position to probe to see if they can take a step down that road. Today, in fact, the North Korean foreign ministry put out a two sentence statement denying that the Americans “being detained” were a topic of US-DPRK talks in the New York channel. But what else does that do? It essentially admits in public that the channel is in operation, and that the Americans could become the topic of conversation at some point.